For many years, timber was the default material for Bay Area buildings. Only substantial institutions like governments, banks and a few wealthy churches were sheathed in masonry — solid stone — and time and again, earthquakes were their undoing. 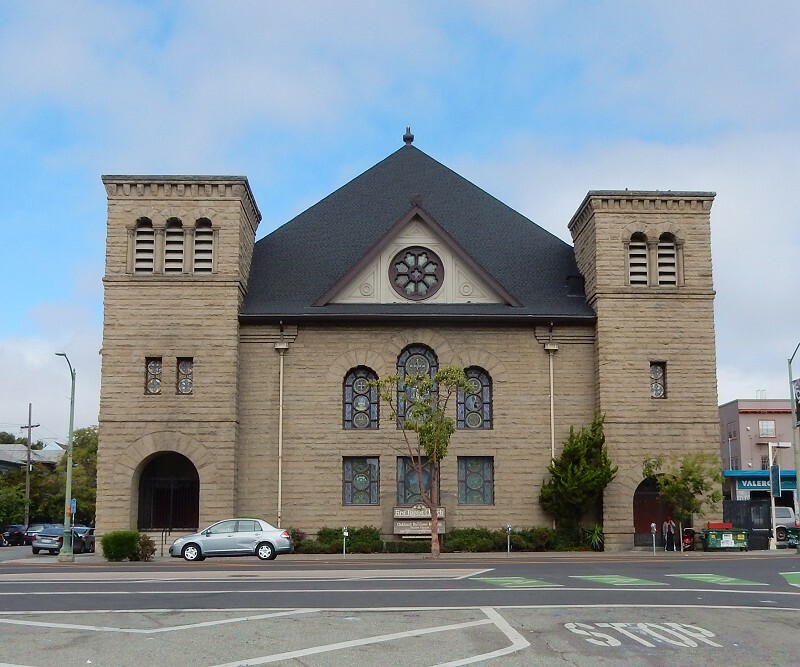 Sandstone was chosen for the walls of two major Oakland churches, First Baptist and First Unitarian. 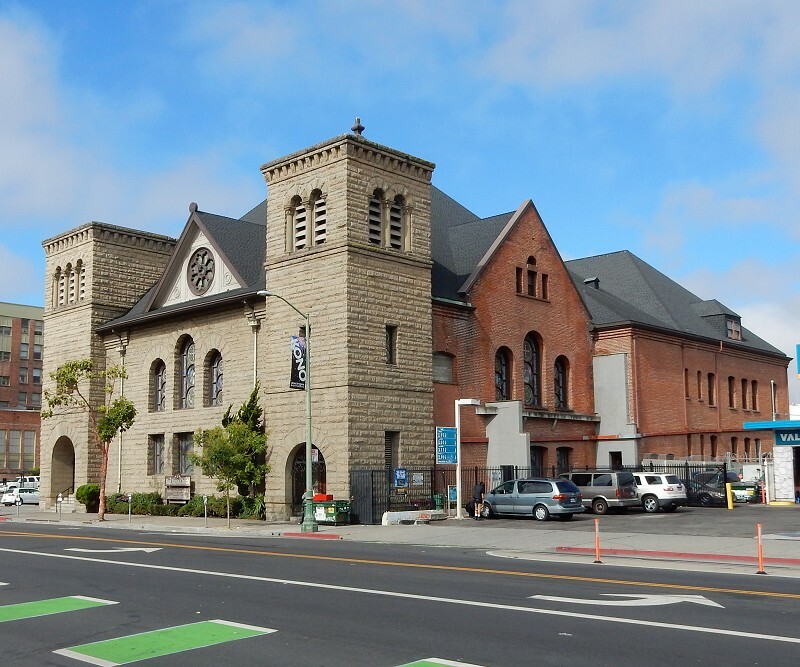 First Baptist, on Telegraph Avenue at 22nd Street, was one of Julia Morgan’s earliest commissions, although she didn’t have a say in its looks. The Romanesque Revival building, inspired by the Aachen Kaiserdom, was designed by another architect whose delays in getting it built led the congregation to fire him once the exterior walls were up, in 1904. The day the church was to vote on Morgan’s design for the interior was 18 April 1906, and early that morning the San Francisco earthquake badly damaged the exterior. She took on the job of rebuilding it, then finishing to her own specifications a magnificent sanctuary inside. The stone, to all appearances, is from the Greystone Quarry south of San Jose. It’s the same golden sandstone of Eocene age (~35 million years) used for the core buildings of Stanford University and other landmark structures like the Carson City Mint in Nevada, Lick Observatory and the old San Jose Post Office, now part of the San Jose Art Museum. 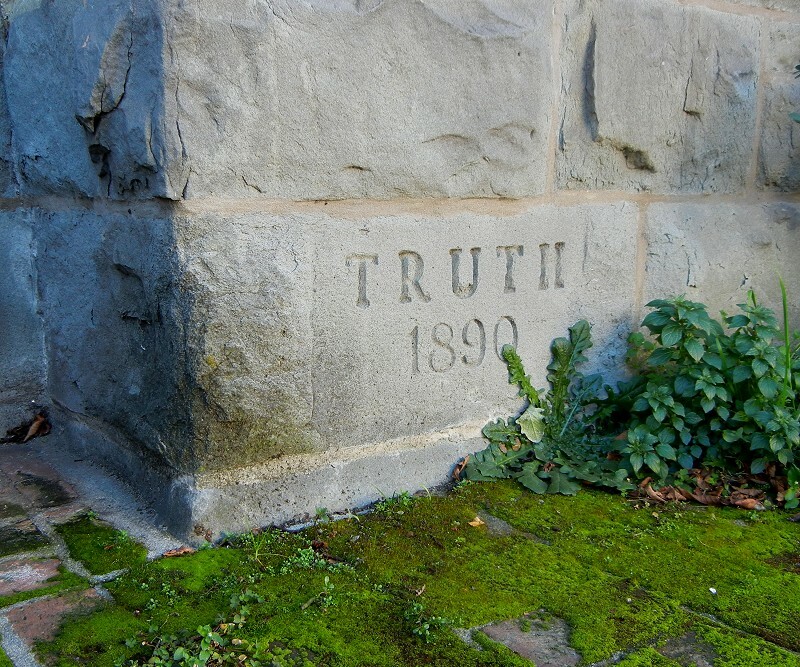 I wrote about this stone for KQED a few years back. 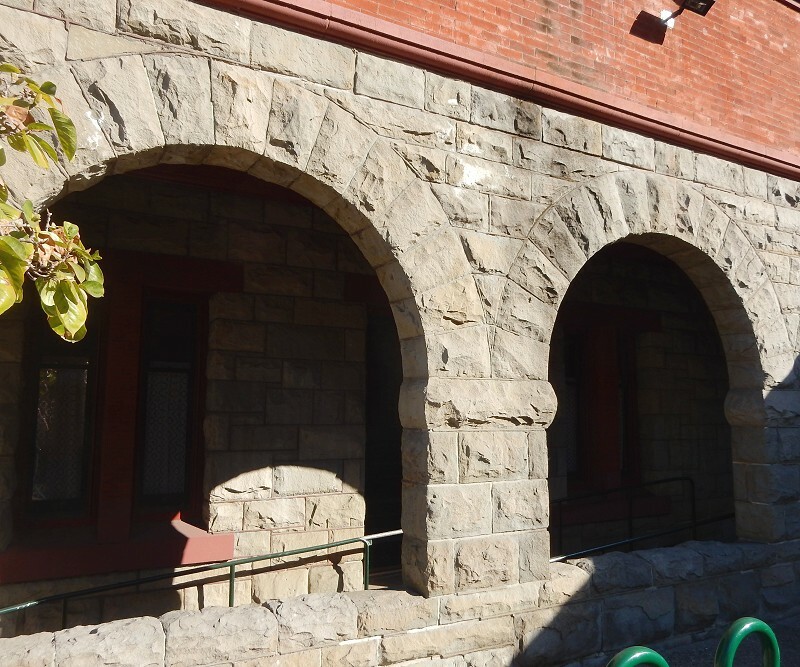 The stone blocks have a rugged “quarry face” on the exterior but are nicely dressed on the sides. The flat sides qualify them as ashlars, as opposed to fieldstone like you’d use in free-standing stone walls. The building also suffered damage during the 1989 earthquake. In this view you can see the seismic bracing, covered in gray, on the north wall that was installed at the time. The First Unitarian Church, at 685 14th Street, was designed by Walter Mathews in the elegant Richardsonian Romanesque style. Construction began in 1890. Stone was an important design choice, inspired by “a spirit of civic pride.” All of the building’s materials were sourced in California. 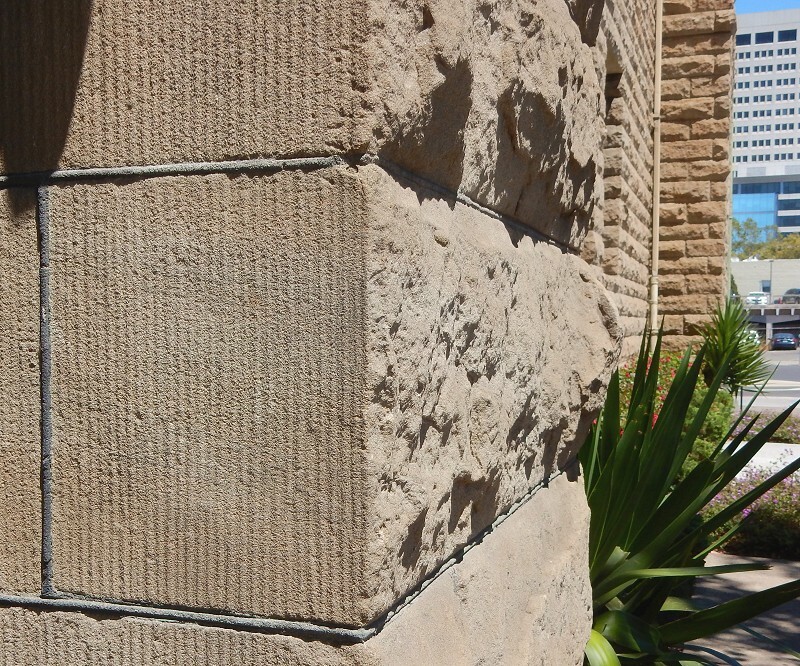 The sandstone is a thick veneer, in quarry-faced ashlars like first Baptist. However, the stone is a cool gray, very fine grained, and is apparently not from Greystone Quarry. Parts of the building are faced in neat rows (courses) and arches. This stairwell bay is pleasingly laid in random-coursed ashlars, a system that avoids a regimented look and is probably stronger too. The building suffered light damage in 1906 and 1989, but repairs in both cases took several years. The church’s Historic American Buildings Survey (HABS) report is full of deep technical and historical detail. 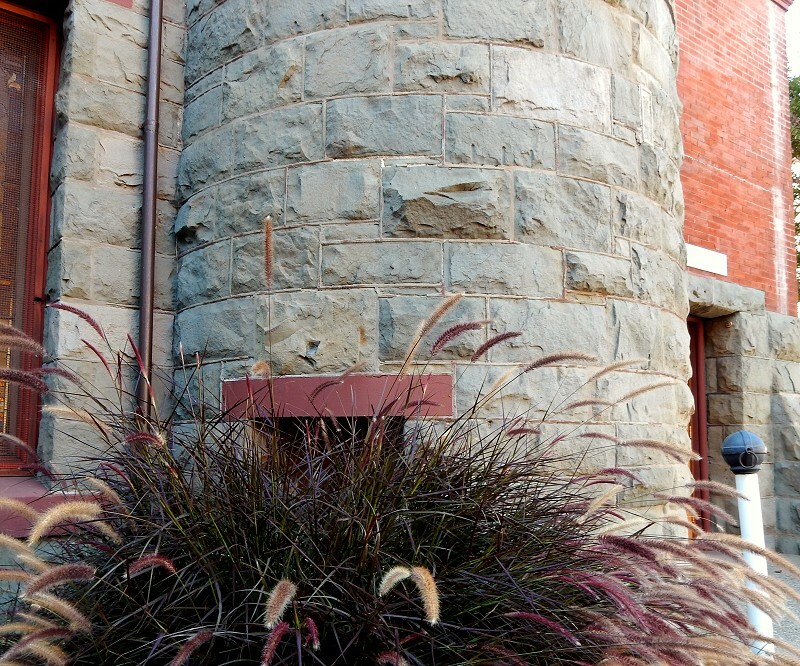 In both buildings, the sandstone shows signs of deterioration after more than a century of exposure. This entry was posted on 19 September 2016 at 8:03 am and is filed under Oakland stone. You can follow any responses to this entry through the RSS 2.0 feed. You can skip to the end and leave a response. Pinging is currently not allowed.